With a medical degree, two specialties and a second doctoral degree in medical research, Dr. White has been an internationally-recognized expert in fibromyalgia treatment and research, fibromyalgia patient advocate, and university Teacher of the Year. Now retired from active practice, he has turned to writing, having already written 4 novels, 9 children's books, one book of inspirational essays to help addicts stay clean, and over 400 songs. 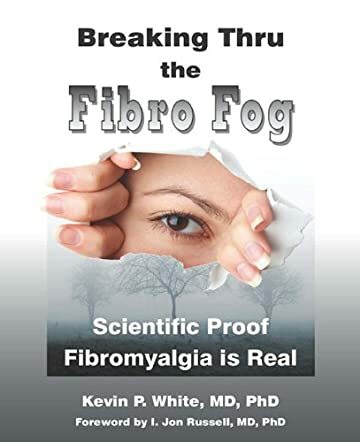 In Breaking Thru the Fibro Fog, Dr. White strives to help millions of fibro sufferers by proving that fibromyalgia really is real. Breaking Thru the Fibro Fog starts off describing Fibromyalgia (FM) in detail: what it is, what it is not, the symptoms, how to expect to feel, how FM is diagnosed and false things that have been said widespread about the disease. The second part is twelve chapters about Fibromyalgia being real, and the scientific reasons to back this up. The third and last part is about the Trauma and Disability of FM. I chose this book to review because I suffer with FM, and I am always looking for new information to read. This book is a good choice for the FM patient because of the wealth of information included. The First Chapter is really informative about every aspect of the disease. The author's details of how's and why's of FM help the reader understand more clearly what is happening in the body with this disease. This book is very user friendly for the doctor, patient and even insurance companies and lawyers dealing with patients who have FM. But the book is most important for the scientific evidence proved here in these pages that FM is indeed a disease. Many who suffer with FM have been ridiculed by friends and family, as well as doctors and lawyers because of their complaints of symptoms of FM. I found it interesting that the millions that suffer with FM all have very similar symptoms, meaning that there is no way all of these people are not making up the same symptoms. If you have FM or know someone who has it, please purchase a copy of this great book and read it!